3. It's a native and highly endangered species. On the Maui FAQ page I posted a picture of this rare bird that I took near the parking lot in the Haleakala Volcano National Park and asked: What is this bird? "I believe that is the elusive Hawaiian state bird, the Nene goose. I tried to spot one on several trips up to the Haleakala Crater, with no luck!" 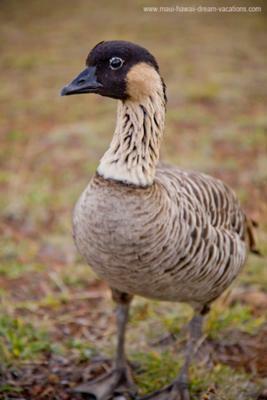 This is indeed a picture of a nene. A very curious one in fact! I was only a few meters away when I took this shot. Charlene wasn't lucky enough to see one, but nene have become more and more accustomed to people and they now come closer and closer. This might be great for pictures, but this can become a real threat to their survival. Nene need to stay away from cars and keep their natural instinct to survive in the wild. Do not give them any food or water. Getting too close can disturb the nene. If the birds move when you move, you are too close. Even the most trained pets can disturb nene. Please keep your pets away from these birds. Take unwanted pets to the local humane society. Why not adopt a nene? You can do so by visiting the Friends of Haleakala website. Comments for What Is the Hawaii's State Bird ? Didn't know the nene was Hawaii's state bird and surely didn't know that it was endangered. I saw one once, while driving to the summit of the Haleakala Volcano to watch the sunrise. Now that I know, I will pay more attention, if I ever have the chance to go back to Maui. Join in and write your own page! It's easy to do. How? Simply click here to return to Maui FAQ.